For architecture buffs, lovers of old homes, or those simply looking for an interesting walk, I have a piece of advice. Get thee to State Street in Albany, where a short five block stroll offers a nearly intact gilded age era streetscape with a kaleidoscopic assortment of houses ranging from quaint frame cottages to splendid mansions to delight the eye. Few homes would have been found here prior to 1830, when Swan Street marked the western edges of town (except on paper). Thanks in part to the Erie Canal and the Railroad though, Albany soon experienced a population surge, doubling in size from 24,000 to 50,000 residents between 1830 and 1850. Hemmed in by the Hudson River on its eastern border, the city expanded westward. State Street and the surrounding blocks (known today as the Center Square neighborhood) began rapidly filling up, initially with modestly scaled dwellings erected for the middle class eager to leave the crowded neighborhoods in the older sections of the city down the hill. By 1860, a few larger, more ostentatious homes began to appear in their midst, built by people with money (and foresight). Things really took off after construction commenced on the magnificent new Capital building in 1867, when it became clear State Street would be the principal thoroughfare connecting it to a new beautiful park facing Willett Street (also in its planning stages). 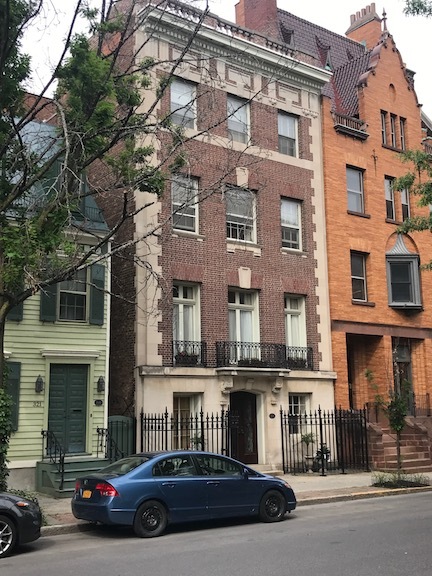 By the early 1870s, larger-scaled Second Empire and Italianate row houses could be found dwarfing their two story neighbors. As the last decades of the nineteenth century marched into the first decade of the twentieth, Albany’s elite, facing increasing crowds and commerce, began to abandon the traditionally fashionable neighborhoods on Elk Street, Mansion Hill and Washington Avenue. Pruyns, Huycks, Lansings and van Rennselaers joined newer-moneyed merchants and manufacturers ,buying up middle-class dwellings as teardowns, erecting larger mansions in their place, or enlarging and remodeling them beyond recognition. 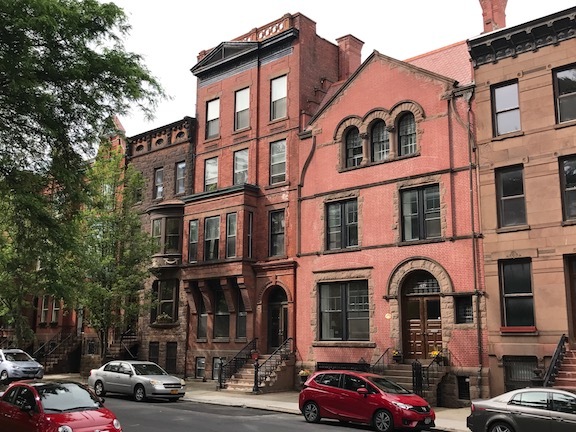 While here and there, pairs or short rows of matching homes were built, State Street never fell under the spell of block-long stretches of identical brownstones. even a Venetian renaissance Palazzo when constructing their creations. Some of the largest and most elaborate of the homes face Washington Park. Romanesque is one of the more commonly found styles here. While it has never been one of my favorites, after observing the breadth and variation on State Street, I gained a new appreciation for it. A number of homes on the street with Romanesque elements - the large brownstone on top designed by HH Richardson. Noting the interesting treatment and carving of the stonework on many of them, it should come as no surprise to learn many of the artisans and craftsman working on these homes had come from crews used to construct the Capital Building. Another popular style found on State Street is Colonial Revival (which has always been one of my favorites). Like their Romanesque brethren, they exemplify how a common vocabulary of stylistic elements can be used to surprisingly diverse effect. State Street has seen its share ups and downs over the years, and demographics have changed. Although a good number of homes have been converted into apartments, government or institutional use, it is incredible to see how much of the original residential fabric remains intact and well-cared for. To best appreciate its charms, I would encourage one to observe it by walking its length westward, beginning at Swan Street to Englewood Place. Not only is it a fairly easy stroll, it is the only way to really get a visceral sense of how it has managed to retain both a residential and distinctly lively urban feel at the same time. No easy feat for a historic neighborhood! Authors note: I highly recommend the book Albany Architecture: A Guide to the City which contains interesting information on the homes of State Street as well as other historic neighborhoods of the City.